Cuban black bean soup is a traditional soup enjoyed by many. This black bean soup is humble in it’s ingredients, yet it is known for it’s simple bold flavor profile. Today’s guest blog post is brought to you by my friend Neyssa from Latina Mom Meals. Neyssa shares her Cuban and Puerto Rican heritage through her Latin inspired recipes, be sure to check her out! The beauty of black bean soup is that black beans have a mild, sweet flavor and pair well with bold add in’s such as ham hocks, loads of garlic, white wine, and saffron. However, not everyone has access to every ingredient, which still gives beauty to Cuban black beans, because for this recipe, we’re going to be making a simplified Instant Pot version with minimal ingredients. Traditionally, dried beans should sit in a bowl of water for 8 hours to soften. Since we are using an Instant Pot, this method can completely be cut out if you’re short on time, but I highly advise you at least soften your beans for 1-2 hours before cooking. Rinse your beans first. I highly believe that Latin recipes thrive on bold flavors, because of this I believe every step should have a flavor profile to build on. With soaking beans, I like to add in a chunk of onion, some cloves of garlic, bay leaves, and if I have it, ham hocks like in my Instant Pot Puerto Rican Kidney Beans Recipe. This is completely optional, just please DO NOT ADD SALT to uncooked beans. Adding salt to uncooked beans keeps the beans from softening as much as desired. For this black beans soup recipe, we’re just going to add in bay leaves. We’ll be making a Cuban sofrito recipe to add into the soup. Once your beans are somewhat softened after an hour or two, and your sofrito is made, you will add in your beans, dump in your water, and set the beans to cook on high pressure for about 40 minutes. When the soup is done, you taste it and at this point you season with salt to your flavor preference. Also, keep reading for the secret ingredient! The sofrito in this black bean soup recipe is made with olive oil, pressed garlic, onions, and green peppers. You will press the saute mode on your Instant Pot for about 10 minutes, allow the insert to warm, add in your olive oil, once it’s warmed you’ll add in the ingredients for the Cuban sofrito, saute it until softened, add in your seasonings and cilantro. Adding homemade sofrito to dishes in the Latin cuisine is the key to a bold and flavorful dish. There’s just something about building the flavor profile. I guess this is where salt, heat, fat, acid really come into play. This simple sofrito is a great base for any bean recipe that you desire to add a Latin twist to! 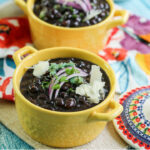 What does Cuban black bean soup taste like? 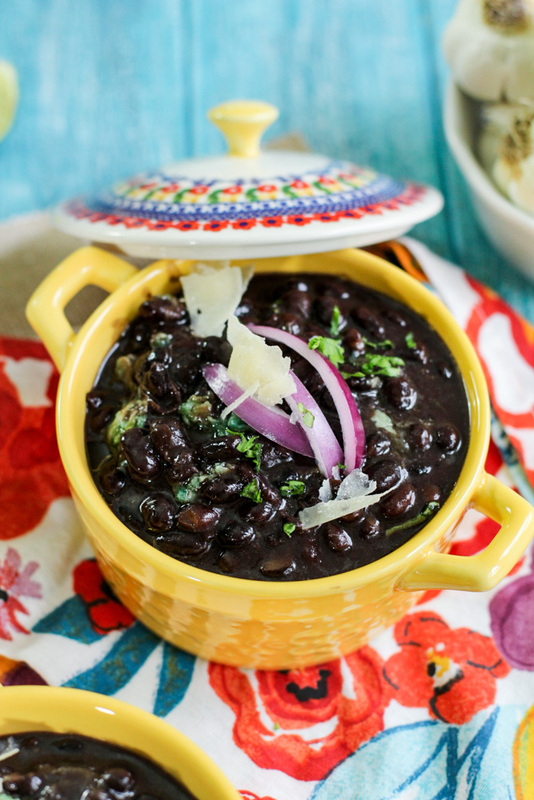 Oregano and garlic take the lead in the flavoring of Cuban black beans. Cuban black beans are savory and bold in taste. This black bean soup recipe has a tiny zing at the end since the secret to an amazing black bean soup is to add in white vinegar once the black bean soup is cooked. The beauty of black bean soup is that you can balance the bold flavoring with toppings such as sour cream and crumbled cotija cheese. Or, if you want to up the bold flavoring even further, you can make a simple garlic mojo and eat the soup with some garlic plantain chips. It all depends on your mood. That’s it mi gente! 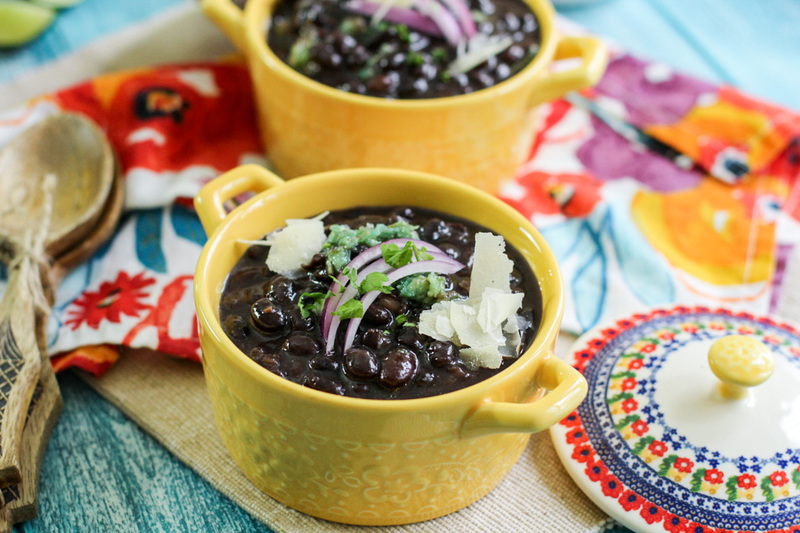 This is how you make a simple Instant Pot Cuban Black Bean Soup! 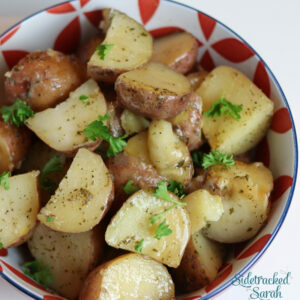 Thank you so much for letting me guest post and share my recipe with your audience Sarah! I hope you all enjoy this recipe, and be sure to check out more of my delicious Instant Pot recipes with a Latin twist over at Latina Mom Meals! Also, let us know in the comments below, what is your favorite way to eat beans?! Feeling fancy? Make this Spanish Saffron Meatball Soup! Cuban black bean soup is a traditional soup enjoyed by many. This black bean soup is humble in it's ingredients, yet it is known for it's simple bold flavor profile. You can top with sour cream cotija cheese, cilantro, garlic mojo, crush garlic croutons or plantain chips, red onions thinly sliced (raw or pickled), and sliced avocado. In the Instant Pot hit the saute function for 5 minutes. Heat oil and add in the onion, green peppers, and minced garlic. Cook for a few minutes and add in the cumin and oregano. Stir often to keep from burning. Next, add in water, cilantro, and bay leaves, mix and add in black beans. Once lid is off, stir gently, and add in white vinegar and taste for seasoning. Add salt and pepper if needed.